The Political Science Club (formerly known as The SPE Nation Club) continues its series of events with Propaganda Cartoons: Superman. 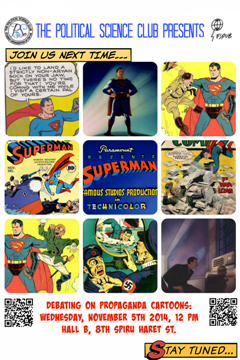 This time, our movie screenings and presentations focus on a symbol of Western culture that, throughout time, has stood for various social and political ideals: the DC Comics superhero, Superman. If today Kal-El from Krypton embodies a model of righteousness who defends global peace and stands for human rights, the situation hasn't always been so. When Superman was first created he was a villain, but he was soon turned 180 degrees in order to become a subject of American wartime propaganda. The Daily Planet journalist Clark Kent and his superhero alter-ego were depicted as defenders of the American Dream through the media and via brute force respectively. For 2 hours, the participants will watch clips of the Superman cartoon from the Second World War, but also get a glimpse of the various comic books involving the hero during the same time frame. Starting from the Nietzschenian Übermensch that inspired the first Superman publication and moving on to the extraterrestrial hero who defends humanity, the character has been an international agenda-setter, and a reflection of the American foreign policy. Join us for the debate! The Political Science Club, an initiative of the FSPUB students from the English language study programmes. All students are welcomed at the Club's public events.